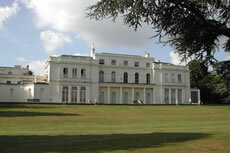 Ealing and Hounslow Must Have "Realistic Plan"
A meeting on Monday night this week in the small mansion at Gunnersbury Park brought some uncomfortable moments for certain members of the Advisory Board, chaired by Felicity Barwood (Conservative, Chiswick Riverside). Matt Harmer (Labour Councillor for Brentford at Hounslow Council) said afterwards that it was a "strange situation". During the meeting, one member of the public told how earlier this year, he had asked a contractor, who had erected scaffolding to replace the lead on the roof of the small mansion, to do something about the buddleia growing out of the chimney. "He told me: "That's not in my brief." So we're sitting here tonight while there's a buddleia growing out of the building." It seems that buddleias are taking root, buildings are crumbling, and tennis courts and bowling greens deteriorate while disagreements mean that Gunnersbury Park continues its sad decline with no hope of moving forward. The park is jointly owned by Hounslow and Ealing councils who share responsibility for it. In August/September a consultation process sought public views on whether or not it was acceptable to look into selling around five acres of the park to a housing developer in return for funds sufficient to improve some of the 22 listed buildings in the park, provide a Sports Hub and generally improve the landscape. The whole project is costed at a cool £39 million. Paul Jardine of Jura consultants started last night's meeting by presenting the results of the consultation which can be found here. The response for the survey was surprisingly good with 4,304 completed (3,682 via post and 622 online), mostly - over 60% - by Ealing residents. The main aim of the survey was to explore long lost features of the Park landscape, bringing the buildings back into harmony with their surroundings and providing improved sports changing facilities. Several statistics provided food for thought: 9.6% of respondents use Gunnersbury Park daily; most use it for walking and general exercise; 60% of the respondents also visited either Walpole Park, Lammas Park or Chiswick House Grounds. 79.5% said they would like to see the Large Mansion House developed as a functions and meetings venue with restaurant at a cost of some £9.2 million with less than 10% against. 75.9% said they would like to see the Small Mansion House developed as a museum for Ealing and Hounslow and wanted the all but ruined stables to be restored as an accessible museum storage facility. 49.8% of respondents agreed that a strip of land measuring 5.6 acres along the boundary of Gunnersbury Park with Lionel Road North could be sold or leased for housing development to enable the option to restore Gunnersbury Park. However, 33.2% disagreed. When asked to choose between keeping things as they are with further decline in the buildings, 60% said they would prefer to see the restoration go ahead partly funded by the sale of land. 51 respondents said they thought the £50 rebate from Ealing Council should have been applied to the restoration of Gunnersbury Park. There were many other comments and some people questioned the scale of the development proposed, saying it should be phased or funded by alternative means. However, when questioned about this members of the Advisory Board said that this would be problematic as the sole funding available - from English Heritage and the Lottery Fund - is only available for the wholesale restoration of the Park. It has been much reported that after the consultation process was complete, and before the results were made public, Ealing council’s leadership suddenly announced that they were opposed to building on the park. As Matt Harmer says: "All very commendable, but couldn’t they have said this before passing £25,000 to pay for external consultants’ work on this project? The two councils will have to seek funding from external agencies like the National Lottery and English heritage and I can’t imagine that they will see the two councils as a particularly professional body given the changes in position." The discussion after the presentation of the survey was not particularly constructive. Ealing Cllr Phil Taylor said that he personally had been keen to explore the issue of enabling development and admitted that the consultation had been carried out partly to demonstrate to funders that it had been explored even though "the concept of enabling development is extremely unattractive to our borough to the point of being unacceptable." When asked why Ealing and Hounslow Councils could not contribute to the restoration of the Park, Cllr Taylor said that there are constant decisions to be made and it can be "excruciating" deciding between doing something to help elderly people or young children. We asked him what excruciating decisions had been made in order to give all Council Taxable residents £50 cashback and he said this was to remind people "what good value for money" Ealing Council is. There is no doubt that this is a difficult project. As Mr Jardine commented: "Other projects are much easier. The buildings here are in such poor condition and there are so many of them. The tools which are normally available are not available here." Mr Jardine also commented that "Jura had been discouraged from including any significant contibution from either Council." There is no doubt that if it goes ahead, this project is going to cause controversy and for every person who feels that the views of those who use the park regularly should be given more weight (Bella Cunha), there is someone else who feels that the views of people who rarely or never visit the Park or who might in the future are more important (Hazel Dakers). It seems most people in the room, however, were agreed on one thing. Matt Harmer summed it up: "As we’re called an Advisory Board, I offer some advice – that the leaders of the two councils should lock themselves in a room and only emerge when they have a realistic plan that they can both agree on." "However, I’m not holding my breath."